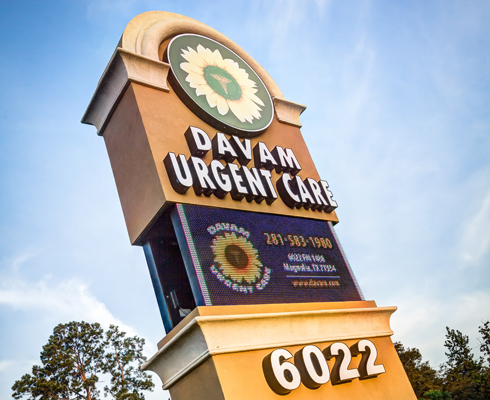 When you need to be seen in an urgent care clinic on a Sunday, turn to Davam Urgent Care located near Montgomery, TX. When your primary care doctor is unavailable on the weekend, our clinic with extended Sunday hours will provide you with affordable and quick care. Visiting an urgent care on a Sunday can help make recovery quicker and allow you to get back to work or school. Our new online check-in system also allows patients to be seen when they choose on a Sunday, without a long wait. Instead of waiting until Monday to see a doctor and taking more time out of your busy life, visit Davam Urgent Care. Our clinic is in-network with most insurance plans and also offers discounted prompt pay rates to help make the visit as affordable as possible. We are open 8am-9pm every Sunday. Please check our website and social media sites for special holiday hours. For more information, contact info@Davam.com or call (281) 583-1980.